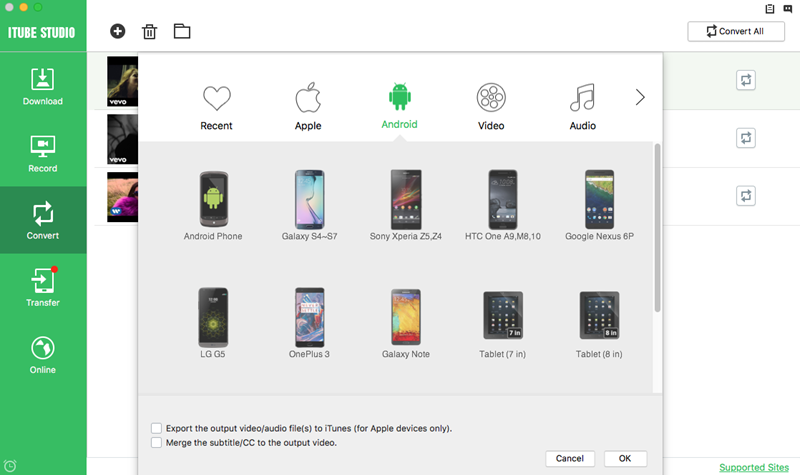 This video downloader for Mac allows you to watch the downloaded videos on your Android phones and tablets easily. Click on the “Download” or "Record" tab to select the videos you want to convert and add them to the convert list. Open the "Convert" tab and click the “Convert” button on the right side of the video list. You will open the output format selection window. Now click on “Android” tab and choose Android Phone or Tablet as the output format. And then click on the “OK” button to start converting the video to Android supported format. You can convert video directly to any Android phones and tablets, including Samsung Galaxy series.